Engage with CEOs of mission-driven brands including Aflac, VF Corporation, Danone North America, ThinkFoodGroup and more. Attend CR Magazine’s CEO Awards dinner. Learn from 50+ speakers including senior leadership at MSL, IBM, Univision, Mars Wrigley, APCO Worldwide and GlobeScan. Discuss common challenges at Issues Tables, our most popular peer-to-peer event. 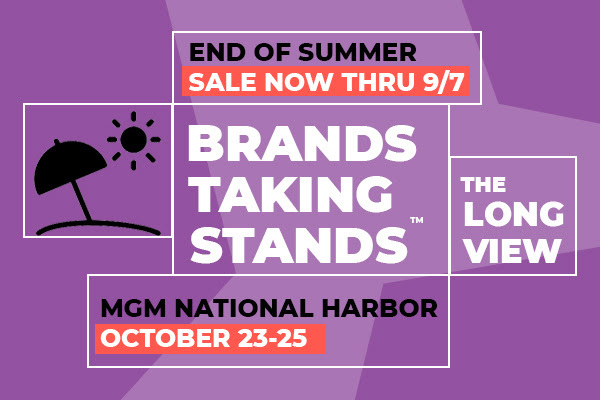 Register today for 3BL Forum: Brands Taking Stands – The Long View, Oct. 23-25 at MGM National Harbor, just outside, Washington, DC. Save 15% before September 7 when you use the code LABORDAY2018FORUM. Interested in sponsorship? Click here. Limited opportunities available.